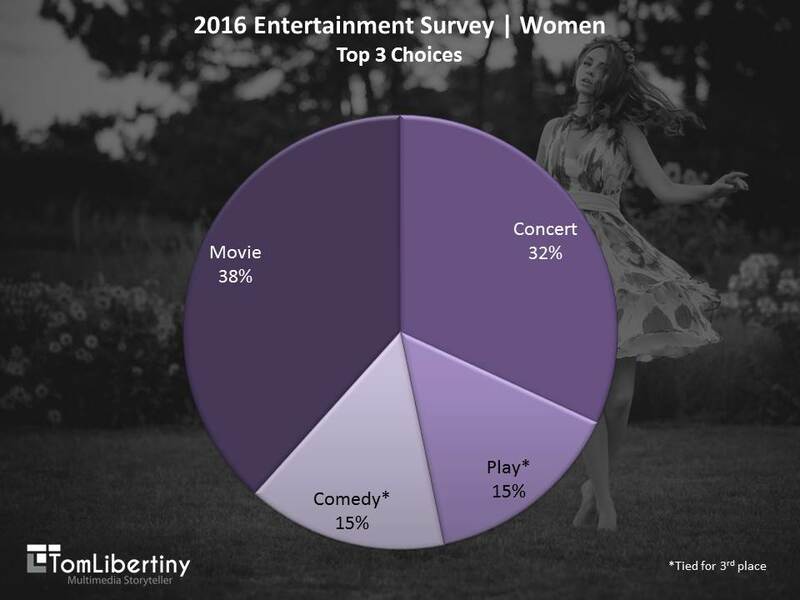 Results of my 2016 entertainment survey for women. Here’s some of my survey results and observations. 1. Women who regularly view entertainment outside of their home: typically movies. For those patrons, pricing was a major consideration. In most markets, $10 was the maximum price per ticket that they were willing to pay (Reference | Charts 1, 2, and 3). 2. 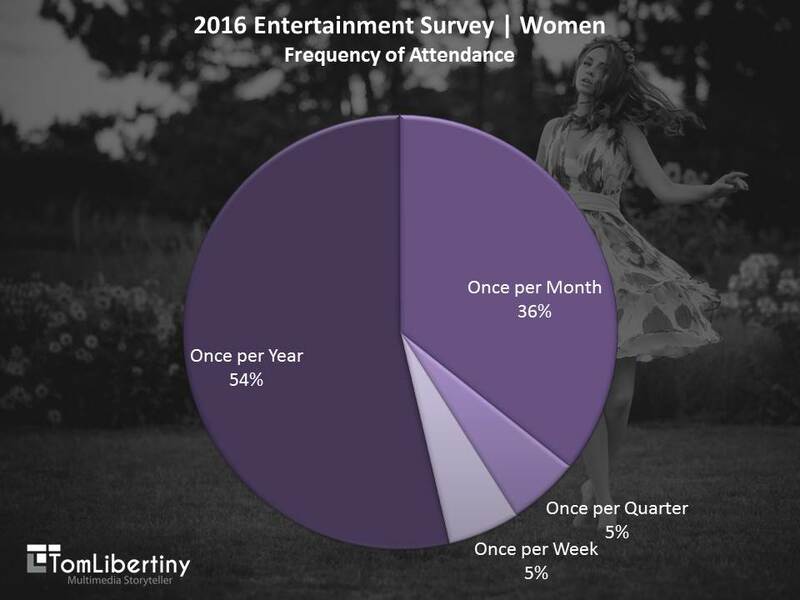 For women who were less frequent patrons of entertainment outside of their home (Reference | Chart 3), they selected special events: primarily concerts (Reference | Chart 1). It wasn’t surprising that money was less of an issue, with the majority of women stating that they’d pay in excess of $50 per ticket. Depending on the frequency of patronage, pricing could be an important factor. As an entertainment provider, would you rather provide the same audience with different content on a weekly basis for $10 or a different audience a new event on a less frequent basis when money is less of a concern? More importantly, can you find content providers and create a business model that combines the best of both worlds: different content on a weekly basis attended by a different weekly audience? The benefit of this model: A much more diversified and larger overall audience that is more recession- proof. This model also leads to much greater word-of-mouth advertising for your content and venue: the most effective form of advertising. And, it may lead to potentially higher profit margins depending on the content you choose to provide. 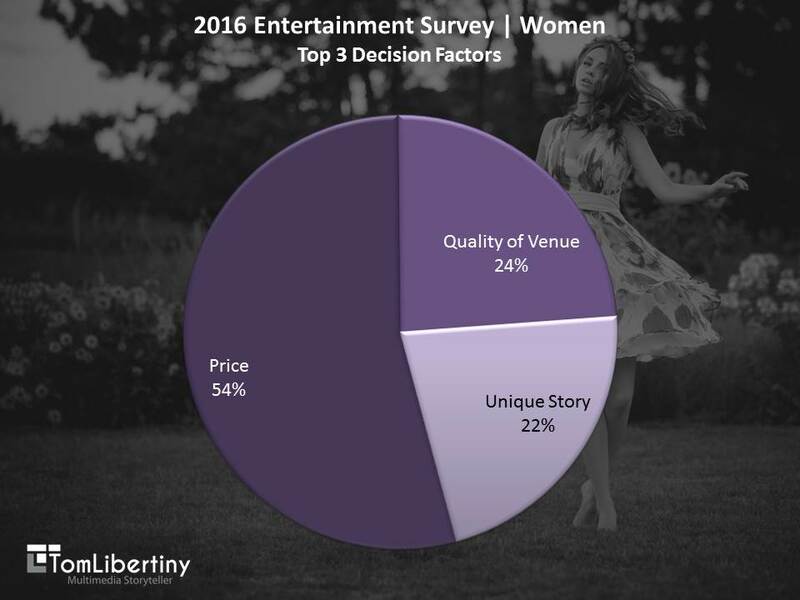 While pricing was important for a frequent entertainment patron, a high quality venue (Examples: Good quality service, cleanliness, safe, easy-to-find, and available parking) and unique stories came in 2nd and 3rd place (Reference | Chart 2).